A sweat extraction machine has been developed by a company in Sweden opening up the potential for a new source of fresh drinking water in the developing world. The fitness industry is abuz with the opportunity to capture gym-goers sweat and to transform it back into drinking water too. Since its launch on Monday, the device has already allowed 1,000 people to ‘drink each others sweat’. Of note is the fact that the output water is said to be cleaner than styandrad tap water. 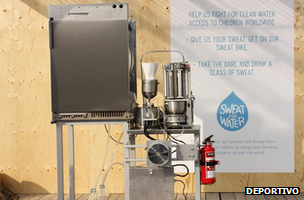 The Swedish sweat-extraction machine was developed for a UNICEF campaign and is able to extract the sweat out of clothes. The first stage is the extraction of the sweat. In order to acheve this the device runs the sweaty clothes through a high-powered spinner, much like the ones that you find in many swimming facility changing rooms. This version spins the clothes in order to vaporise the water, which effecitvely extracts the sweat. The second stage involves running the sweat vapour through a proprietery membrane, which only allows water molecules through. We live in a world where 780 million people have no access to clean water, so this device has the potential to be a scalable life saver. As opposed to investing in bottled water, charities can potentially invest in these machines instead. This opens up the opportunity to provide fresh water for families over years, as opposed to just providing one serving of water. The machine was designed and developed by Andreas Hammar, a serial, yet somewhat wacky, entrepreneur. Previous tech projects have included a skirt that displays tweets. Similiar technology has been used in space in order to provide drinking water in the most hostile environment that man has been. Therefore, it is far from outrageous to carry high hopes that this machine can work wonders for the worlds water supplies.